Shane Watson (2/10): The burly Aussie opener’s poor form with the bat continues and his last year heroics seem like a distant memory now. Otherwise, he would’ve gone on his backfoot and played the Harry Gurney slower ball through point. But instead, he found himself dead in his tracks and ended up being caught plumb for 6. Faf du Plessis (6/10): We’ll talk about batting later. Because it’s the time we talk about what a brilliant fielder Faf is! Four catches in the innings, with each one being better than the previous one, du Plessis put up an exhibition of sorts. That confidence didn’t translate to batting though as he was dismissed for 24 by playing a poor stroke against Sunil Narine. Suresh Raina (8/10): There was a sign of old Raina in the way he batted against KKR. Pure calculative mindset, and didn’t get bogged down even when MS Dhoni was dismissed. 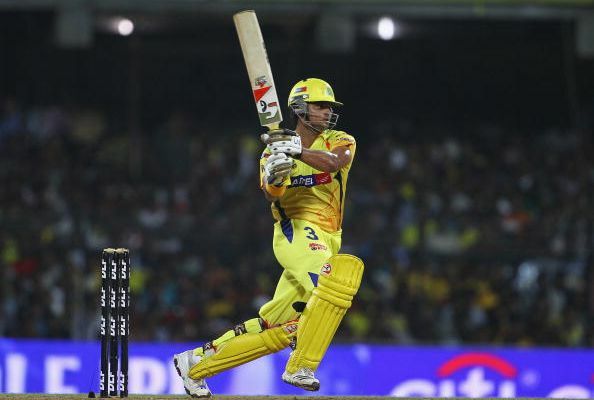 Raina ensured that he stayed until the very end and led the team to their seventh victory in eight matches. It was the batting masterclass on every count. Ambati Rayudu (2/10): Just a day before the national selection committee will sit to finalise the Indian squad for the World Cup, Rayudu put up another disappointing display with the bat and was dismissed for five. Was it because of the mental block he is having? There could be many explanations for it, but the time has come for MS Dhoni to sit down with him and discuss the problems. Kedar Jadhav (5/10): In the space of 12 deliveries, Kedar Jadhav ensured that there was a shift in momentum from KKR to CSK. He didn’t look like the most elegant batsman around, but his street-smart nature allowed him to hit fours behind the square, almost in an unassuming manner. The way he hit Kuldeep Yadav for a six over square-leg was the major reason behind the spinner being under pressure after that and was forced to drag his length back. MS Dhoni (3/10): By hitting the third ball he faced for a six, the CSK skipper showed his intent of finishing the game early, but was soon found wanting against the balls drifting in. That eventually brought an end to his innings, and it is safe to say that the timing of the dismissal put pressure on Suresh Raina. Could’ve been more sensible. Ravindra Jadeja (1/10): On a day when Shardul Thakur bowled with an economy rate of below five, it is hard to wrap his head around the fact that Ravindra Jadeja went for 49 runs in his four-over quota. The grip was very hard to overcome and when the left-arm spinner tried to drift it in, everyone was so happy to put them away. His insistence of not to move away from the template was another reason for Jadeja to remain wicket-less tonight. Mitchell Santner (6/10): Known for his economical bowling, Santner was more attacking in his instinct tonight. Instead of darting the ball on the stumps, he bowled on the channel outside the off-stump and asked the batsmen to take risks against him. That eventually paid off as Sunil Narine, trying to go big, gave du Plessis a catch at deep. A quality performance. Deepak Chahar (4/10): Deepak Chahar could be the epitome of the sporting adage that you're never as good or as bad as you think you are. The swing bowler from Jaipur, who had never been taken out from the powerplay so easily, was whacked by Lynn from the word go and he eventually ended with an economy rate of 9. Shardul Thakur (8/10): The Mumbaikar proved that if a bowler is guided properly, then he can be exceptionally well at times. Shardul Thakur’s tale resonates in the same vein and just being true to MS Dhoni philosophy of gaining control, he ended up with 2/18 on a belter of a wicket. Was impressive on the field as well. Imran Tahir (8.5/10): If I have to choose someone to play for my life, I will happily go with Imran Tahir because of the form that he is in now. Take today for example. With the wicket having little to no help for spinners, he allowed himself to go for the jugular, and almost forced the batsmen to make errors in judgement. He did that on the back of considerable skill, something that MS Dhoni would be very proud of.